Who doesn’t love an evening out at book club? Sometimes, it’s as much of an escape from daily life as reading the book itself. I would say the majority of my friends are in a book club and their get-togethers are as varied as the books they read. Some people have a formal Q and A with lots of rules and regulations, while others are extremely casual. Some friends have an elaborate spread with food and wine and others keep it really simple. Whether you serve a few snacks or a full pot luck meal, decorating for a book club evening can enhance the fun. 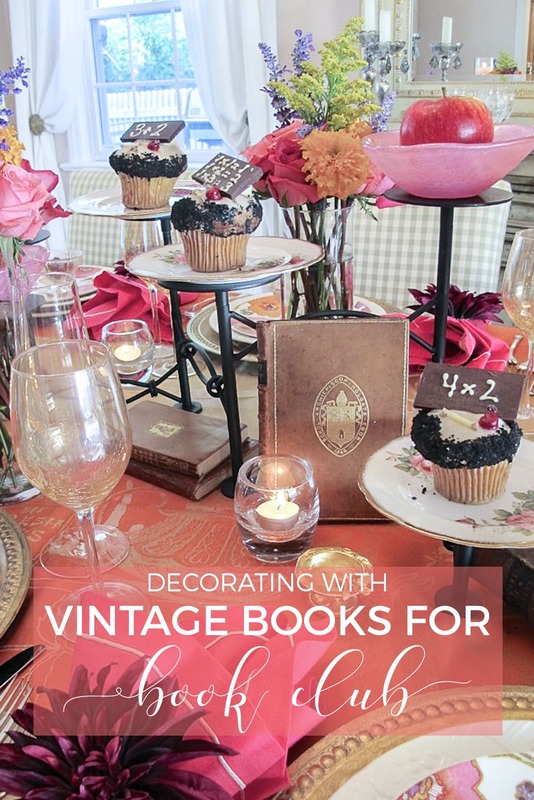 For my book club table setting, I’ve based my decor around vintage books. 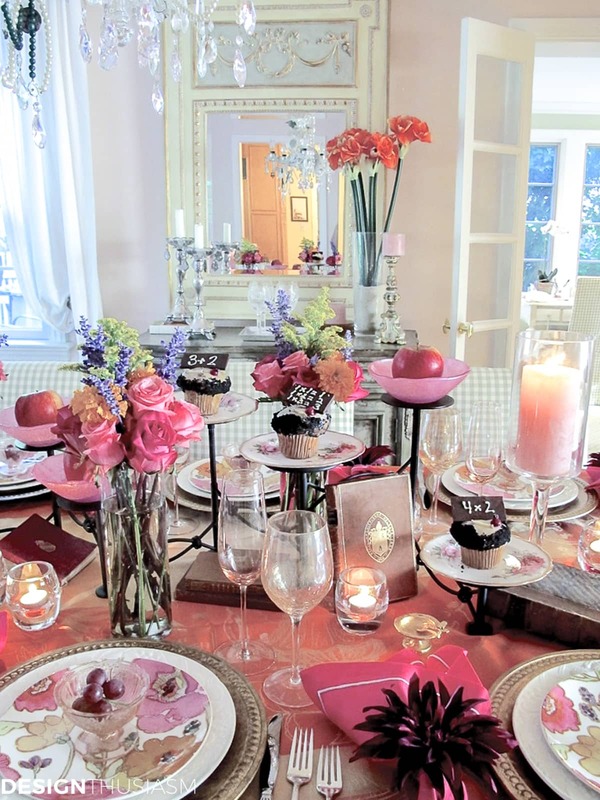 Unlike most of my table settings that aim for holiday elegance, with this table I was going after relaxed fun. Since serving at book club is not generally a formal sit down event, there are lots of bits of interest added to the table that guests can see as they walk around the table. To vary the heights I used a fireplace candelabra to serve as a riser. The color palette I kept bright and convivial, rather than a sedate library atmosphere. The pinks in this setting range from a mid-tone pink to a deep fuchsia, mixed festively in the colorful florals. 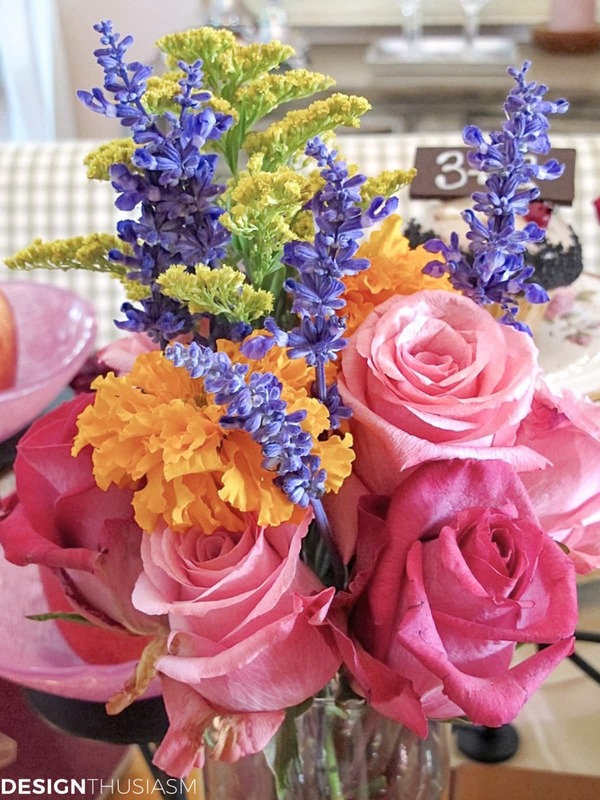 Roses are the base of the arrangement but salvia and other flowers add cheer to the table. The floral plates drove the color story, set against a cream textured dinner plate and the gold beaded chargers. The stemware reflects similar tones with a golden crackle goblet and pale pink champagne flutes. 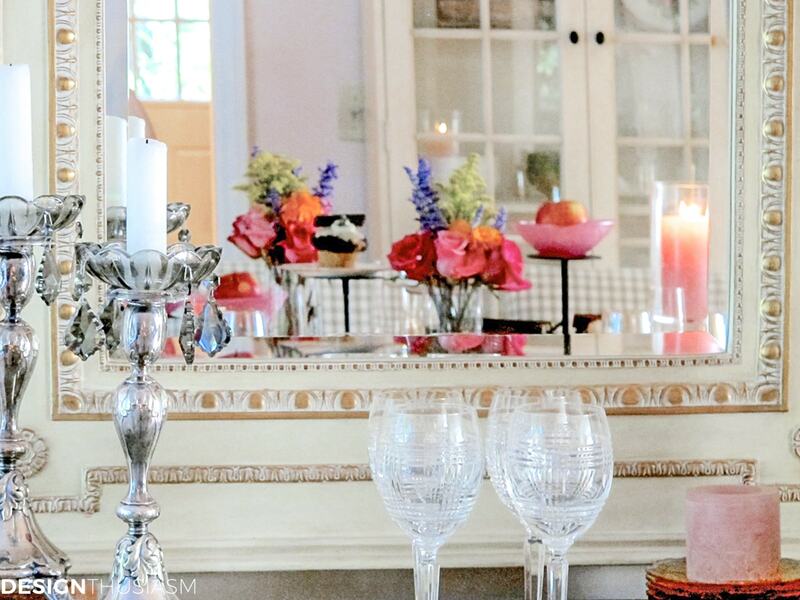 Pink pillar candles add a rosy glow to the room. Apples and sweets rest on the multi-leveled candle holders, while arithmetic cupcakes are a whimsical addition. They play off the vintage leather-bound books, lending a touch of a back-to-school feel. 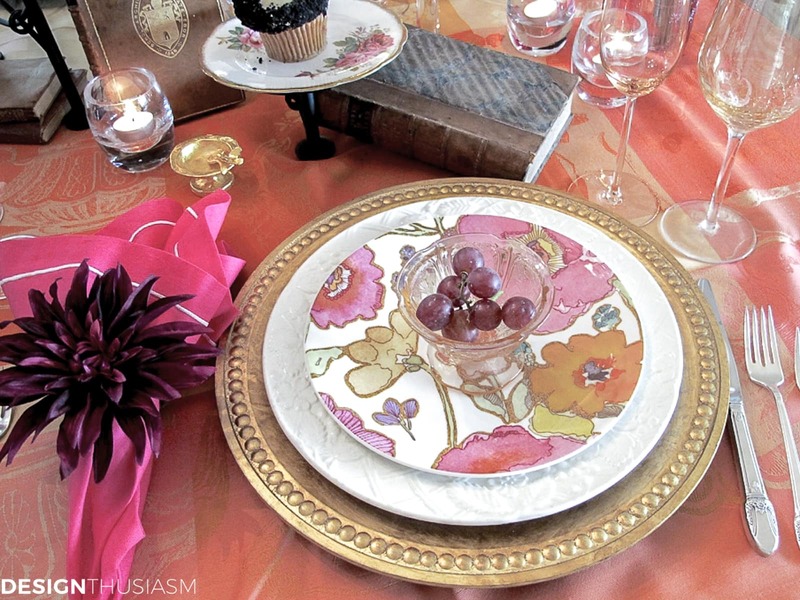 Grapes are served in pink depression glass dessert cups, topping off the multi-hued plate stack. The real key to the table setting is the inclusion of vintage books and I always choose my books for both the beauty of the leather and the content of the title. I prefer to collect books that I would actually read, rather than obscure tomes that have no meaning to me. On this table, the books were thread into the layout, leaning against objects and layered a few together here and there. You can see the various elements working together. 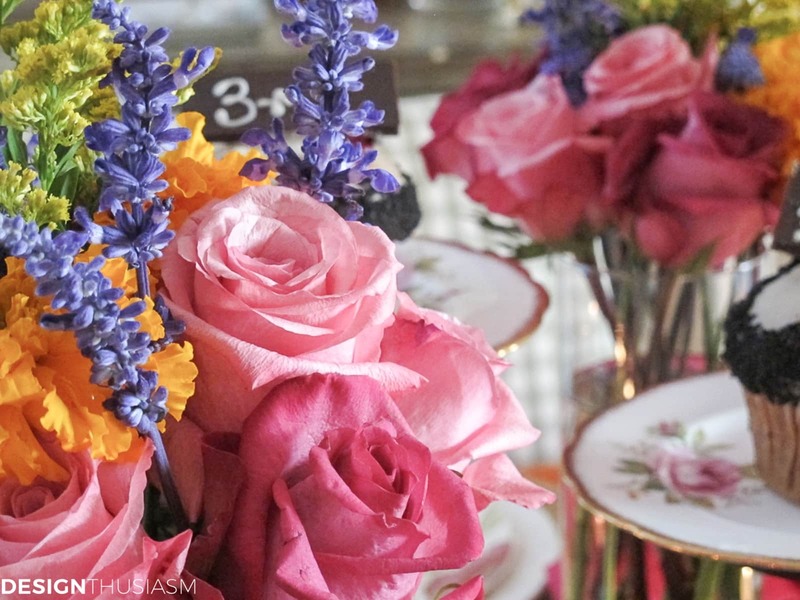 The florals are spread throughout the setting, while the perched cupcakes sit atop vintage china plates. 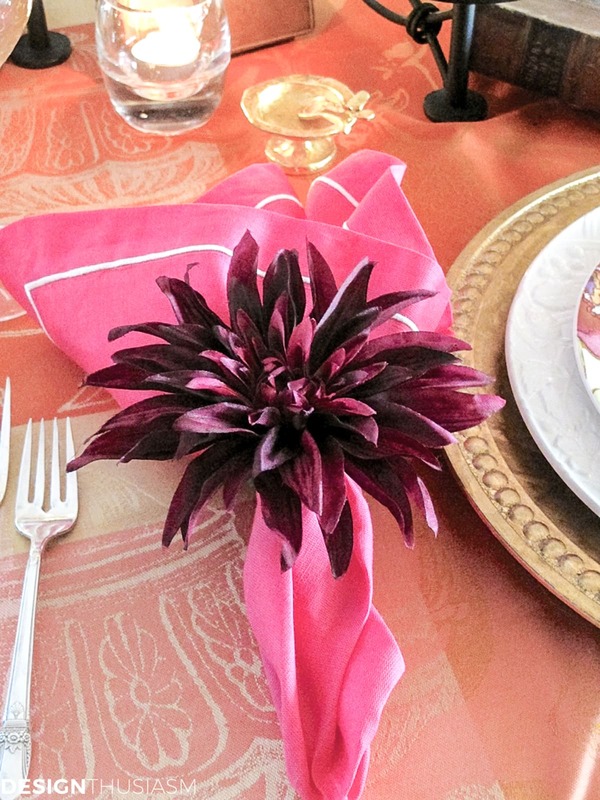 Fuchsia napkins are wrapped in gorgeous burgundy dahlia napkin rings. The French jacquard tablecloth in all the same warm tones pulls everything together. There are so many ways a table setting with vintage books could go, from pale neutrals to dark masculine colors, but for my gathering, I chose to stay bright and cheerful. An evening at book club is a pleasurable event and a delightful opportunity to spend time with friends, so I enjoy decorating my table to reflect that ambiance. This has got to be one of the prettiest tables I have ever seen! Pinning! 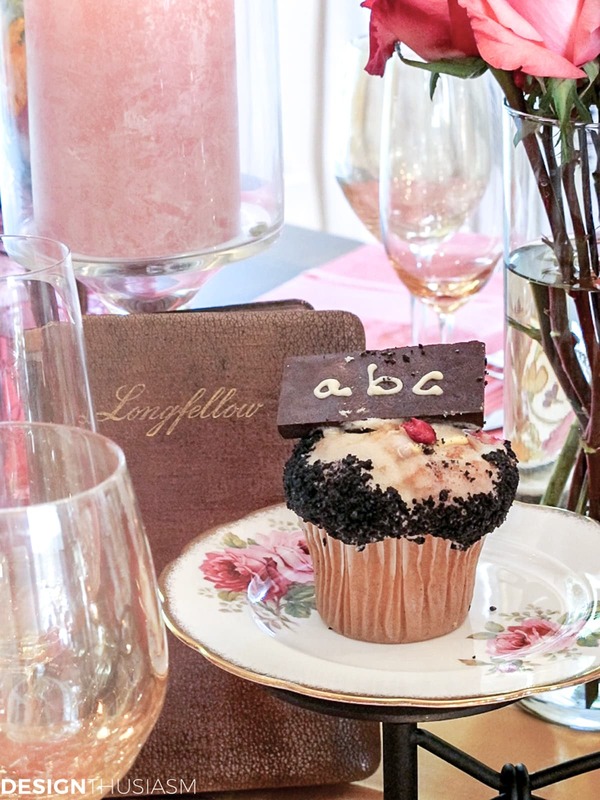 Lory you always have the prettiest table settings! 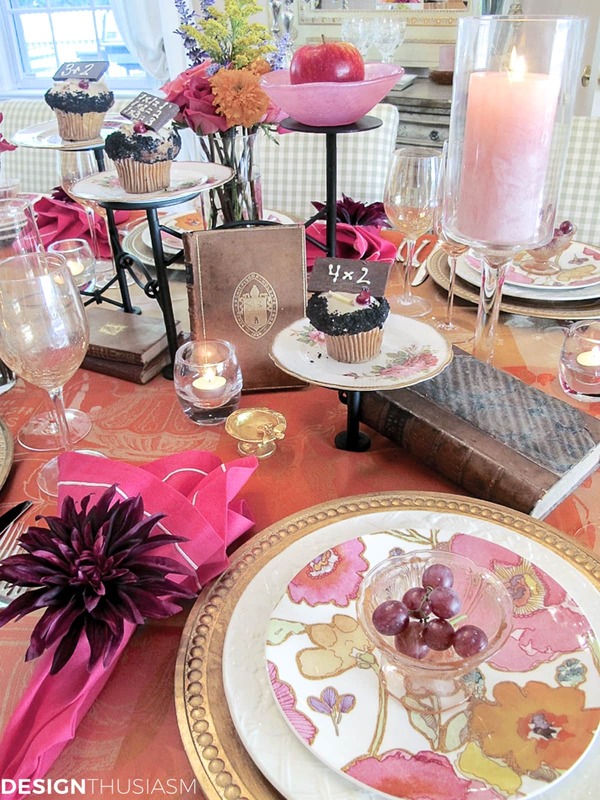 So pretty Lori, I love the deep pinks with orange and yellow~gorgeous plates! I love the floral plates! So beautiful! Beautifully styled Lori!! Layering the books and vintage pieces of depression glass worked perfectly… clapping!! You had me at vintage books and little math equations! I’m a math geek and love numbers. Not much of a reader, but I have a thing for vintage books. Came over from blogtalk. SO lovely!!! I love the bright colours and those dishes are amazing!!! I love how colorful everything is!!! Great job! I Absolutely love the colors and textures on your table. There’s no such thing as too much when it comes to hot pink! Gorgeous! Love the colors in this. You are a master at designing the centerpieces and mixing different elements together. I was just looking at that color of stemware at Pier 1 yesterday. They should see how you used it- truly beautiful! Thanks so much Liz! What a nice comment… 🙂 Made my day! Wow ~ it’s such a pretty explosion of pink! So perfect for a special event like the one you are hosting. Great job! I love all the bright and happy colors. Beautiful table! Wow – these colors are just so bright and cheery! Beautiful touches with the old books, napkin rings, and unique centerpiece. Love the photo from Capri – one of my favorite views of the “rocks”! A truly beautiful and elegant table. Love the way the floral plates match the real flowers. Beautiful! Nice observation, Bev! Sometimes we do things subliminally without even realizing – designing by instinct… 🙂 Thanks for taking the time to comment! Such wonderful inspiration for creating a tablescape for a book club. Your design talents are so inspiring. It is amazing what you can create with dishes, linens, flowers and other accessories. It is also a pleasure to meet you through blogland! 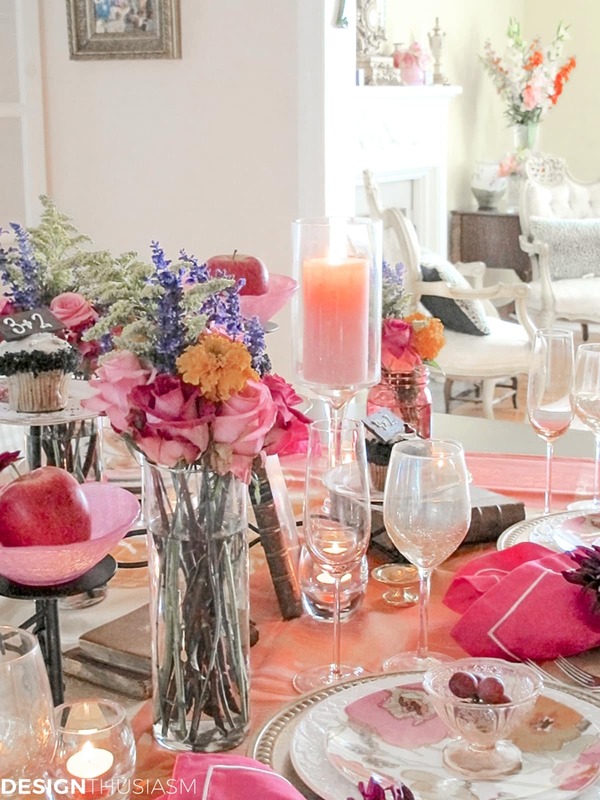 I love the pretty floral plates, the pink and orange make for a colorful garden like table setting.